This ornament can be made from old Christmas bulbs or light bulbs. 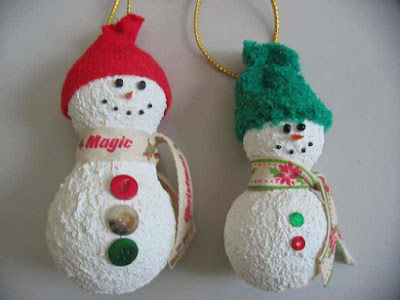 I replaced light bulbs in my house with compact fluorescent light bulbs and recycled the old bulbs into these ornaments. * Available at craft supply store, or you can make your own by adding sand to white paint. Cut out piece of the styrofoam ball so that it will meet the base of the round part of the bulb. Press ball onto to bulb with glue. Wipe off the bulb to remove any oils. With paintbrush brush the snow accent paint onto the bulb. Let dry. Paint the styrofoam ball and be sure to paint in the crease where the bulb and ball meet. Let dry. For the snowman's hat, glue fabric or sock top onto the styrofoam head. Tie thread or string around the fabric to form hat and for hanging. Add eyes and mouth by gluing on seed beads. Paint a toothpick orange, cut and apply a small amount of glue then carefully push into the styrofoam head for the nose. Tie ribbon around the neck for the scarf and glue buttons or any other embellishment (I used sequins on the smaller snowman) down the front of the snowman. Copyright © 2007 by Laura B. All rights reserved.